Thank you for successfully submitting your details, we really appreciate you getting in touch. Your record will be updated on the NHS Organ Donor Register. It is essential to let your family know whether or not you have made the decision to donate your organs and/or tissue when you die. If donation is possible and you are on the NHS Organ Donor Register we will inform your family of your registration and ask them to support the decision you made. If you have registered a decision that you don’t want to donate, we will discuss this with your family to ensure they understand that you did not want to be a donor and check that they don’t have any more recent information about your decision. Your family won’t know what you want unless you tell them so don’t let it be a surprise, help them now to support your decision at a difficult time. 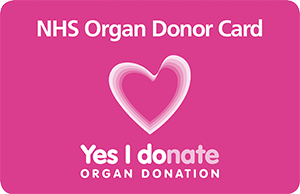 We don’t send new Organ Donor Cards to people updating their record, but why not download and share one now? Text or WhatsApp your donor card to friends and family. Download a lock screen for your smartphone, and show your support for organ donation wherever you are.